Uni Trend’s UT58B is a popular general purpose multimeter in the mid-budget price point. With its large display, it is able to measure high voltage, amperage, resistance, capacitance and frequency, as well as temperature and other ranges not often seen at this price. The UNI-T UT58B mostly suits those with some familiarity with multimeters as it is a manual ranging meter. There are five meters in the UT58 Series. They run A through E, with others offering slightly different ranges, features and levels of accuracy. 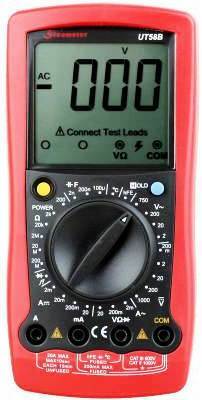 This particular UNI T multimeter is also sold with the Sinometer brand through an OEM relationship. Sinometer is another Chinese brand, on par with Uni Trend and Tekpower. The UNI-T UT58B takes its time to measure larger capacitors, and while there is a function for measuring transistor gain, this is seldom used. You can also check for continuity and test current drop across diodes on the same range – it has an audible beeper. Temperature & transistor gain: the temperature feature is a big plus for many, with a stated range from -40°C to 1,000°C. There is no Fahrenheit setting unfortunately, but a Type-K thermocouple cable and an adapter plug come included with the multimeter. In addition, the adapter has insertion sockets for quickly testing capacitors and transistors. The screen on the UT58B is 2000-count and large for the meter. Other features include a manual data hold and an auto power-off, though there is no backlight on the display. Despite being a Chinese make, the UNI-Ts are actually quite well put together, externally. This meter feels sturdy and has a protective rubber, removable holster for drops. It can be operated with one hand on the bench, since it comes with a wide kickstand that keeps it grounded. As it is a manual ranging multimeter, the dial spins all the way around. The screen takes up almost half of the face of the multimeter. It is a 3½ digit LCD display, meaning it can display a maximum of 1999 counts before it drops back a decimal point and loses a digit on the front. If measuring on the 20V range, for example, it would read 19.99V before dropping back to 20.0V. The screens on the UT58 Series are pretty good and are viewable from an angle. It refreshes around two to three times a second, which is not super-fast but okay for this level. All icons display onscreen, including low battery and auto polarity, but beginners might find the dial switch labels confusing. The advantages of manual ranging multimeters for those that prefer them are that they tend to respond more quickly than auto ranging ones, plus they also display all of their ranges. This means there is usually only one item per given dial selector position, such as with AC volts, DC volts, AC amps, and DC amps. Buttons & inputs: there are just the two buttons on the UNI-T UT58B; power on and the hold button. The latter is used to freeze the display, which can be useful in dim light conditions or if you can’t see the screen while measuring. The four jack sockets are not color coded, but are appropriately labeled, with the common and main terminal on the right and the amperage inputs on the left. The UT58B lacks basic protection that would make it safer to use at high voltages. While it states CATII to 1000V and CATIII 600V, it is not recommended you test to these energies at mains voltages, or 480V three phase. Amperage is rated to 20A, but that is for short bursts of 10 seconds max, followed by a 15-minute cool down period. The main current input is not fused, while the milliamp input has a glass 200mA fuse. Input indicator: despite lacking in some areas, it does have an interesting input safety feature. An onscreen prompt lets users know the correct probe lead configuration when the dial selects a range. In the review of the UNI-T UT58B, this is a handy little meter for those into general electrics and electronics work. It has a nice large screen and most input ranges, including temperature. On the downside, it is manual ranging only and suffers on input protection, so may not appeal to absolute beginners. Alternatively: There are many other brands in this price range that you also might want to consider, such as the Mastech MS8229 or Amprobe AM-510. Both offer auto and manual ranging.